You will find all current standards of the DIN – Deutsches Institut für Normung – German Standard Institute. Included are DIN-EN-, DIN-ISO-, DIN-ETS- und DIN-IEC-Standards; excluded DIN-VDE-Standards. The search for DIN-Standards-online and the reading of the documents via the PC-display is allowed to all clients of the library. Only members of the TUHH are allowed, to print copies for non-commercial purposes. For lectures and exercises members of the TUHH are entitlet, to duplicate single dokuments as well. You are not allowed to modify DIN-Standards. 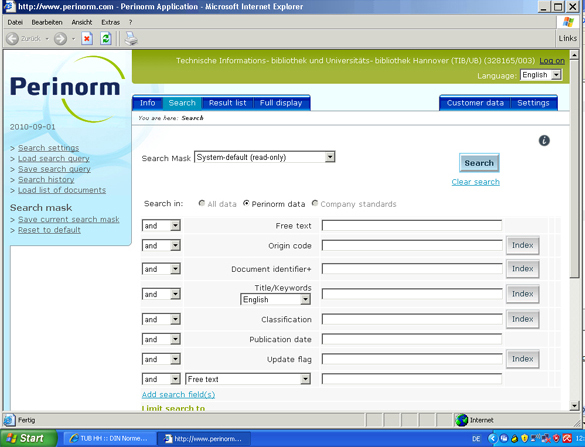 After starting the PERINORM Screen with the standard search field opens. In the green band you have the opportunity to choose the language adjustment. Start your search via the standard search field. You can change the different functions by using the blue tabs. After the search, open the documents full text via the symbol or a similar icon if available. By using the “i”-Symbol on every page of the application, you can open an appropriate help text.